Our designs grow out of a vision of the way each project can affect the lives of the individuals for whom our buildings are created. They evolve from a deep understanding of the building’s program – its complex operation – in short, the life intended within it. The building’s program and the efficient use of the project’s resources are the springboards for invention in architecture. Our commitment to expressing what distinguishes a building’s program and site has resulted in a sequence of unique designs – we do not have a preconceived aesthetic for formal style. 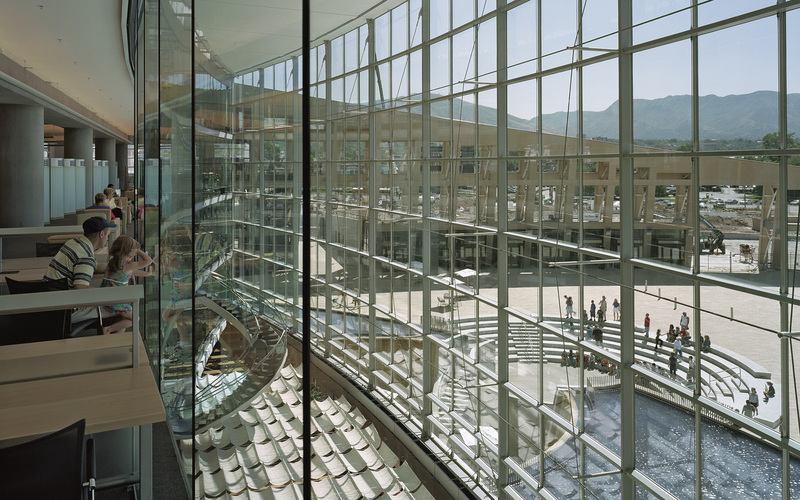 Upon approaching the Salt Lake City Public Library from the piazza, one can see the stacks prominently on display through the glass lens – announcing the purpose of the building for all to see. 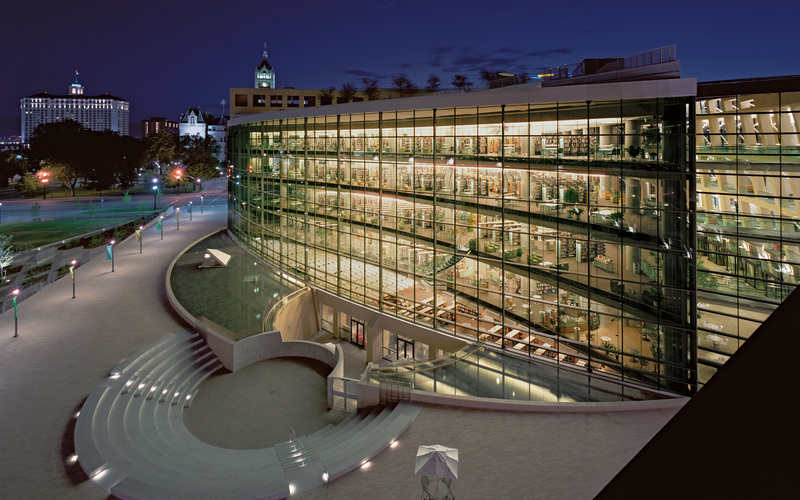 The library itself is formed by triangular central stacks, a linear building housing the administration functions and reading galleries around the perimeter of the crescent wall – all connected by a network of bridges in the main library stacks that surround the ground-level urban room, which is conceived of as a hub for events and public interaction. Glazed elevators and open stairways connect the levels, further knitting together the different spaces of the library while simultaneously cementing the urban room as a vital space for bringing people together. 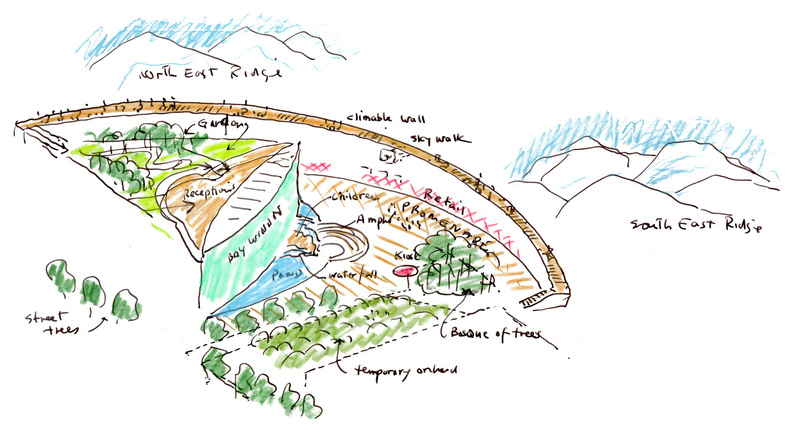 The primary "face" of the library is composed of a five-story double-glazed "lens", which opens the traditionally isolated stacks to views of the city and mountains beyond. This great transparent face connects the the stacks above with the children's library on the lowest level, which then spills outdoors into an amphitheater and children's garden. 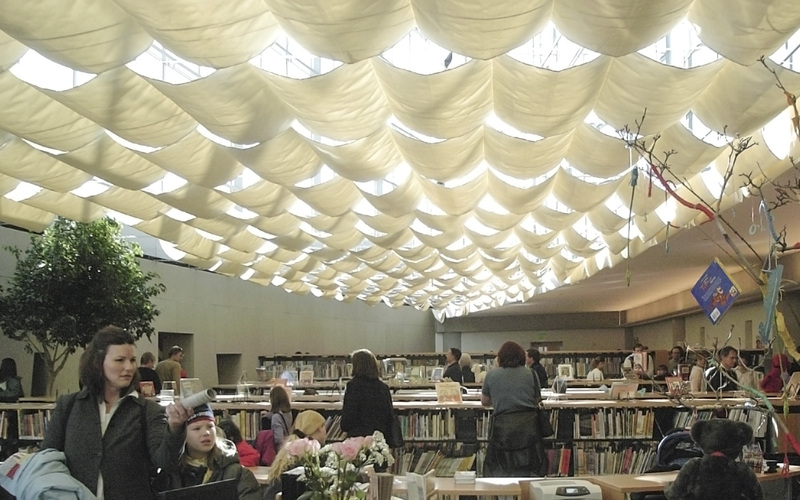 It also protects the stacks and spaces within, providing shade in the summer while trapping the sun's heat in the winter. 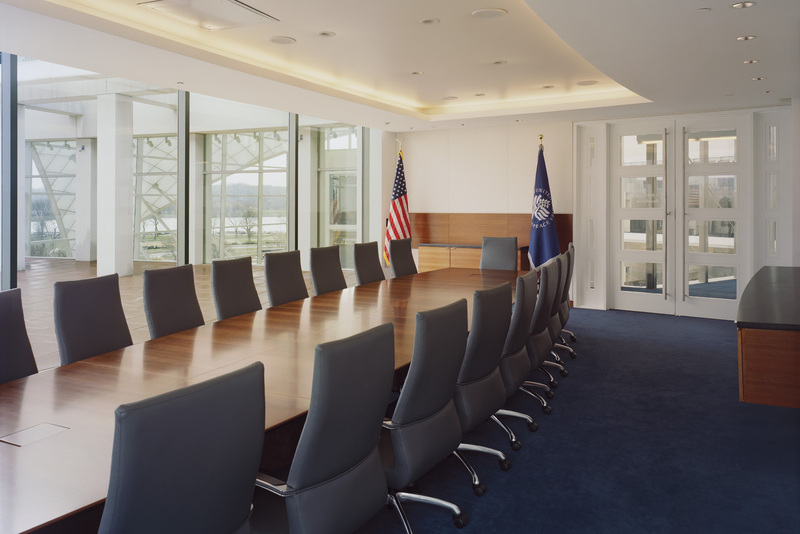 As the Institute for Peace’s first permanent home, our design supports the critical mission of international conflict management, balancing the need for a range of scales of working spaces with the desire to promote interaction and community. The innovative workspaces look into the atria, bringing light and openness into every space of the Institute so that its very nature fosters dialogue and exchange. 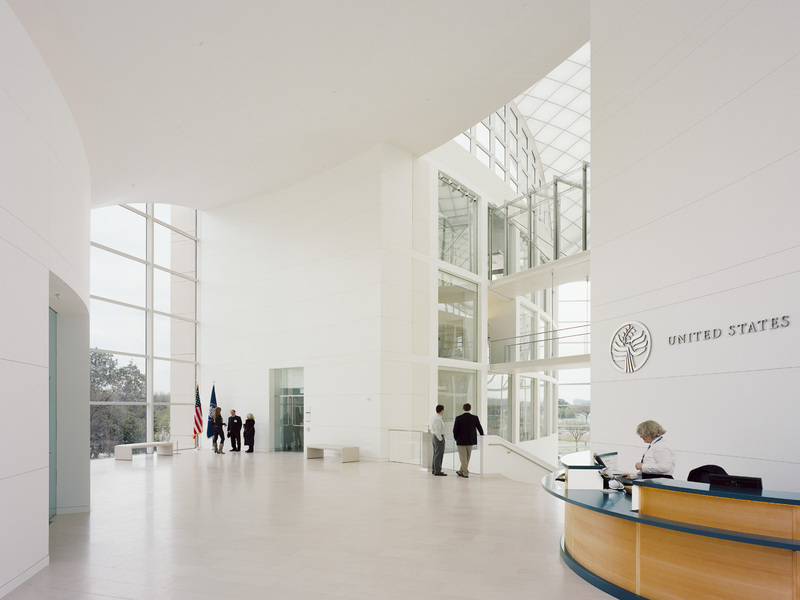 The program encompases administrative offices, research facilities (including a library and an archive), a conference and negotiation center, and an interactive educational center dedicated to the theme of peacemaking, all organized around two atria. 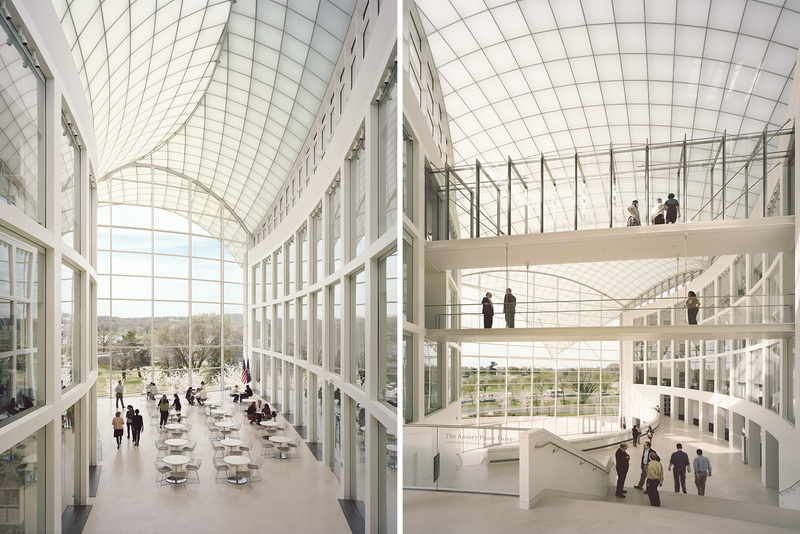 The first atrium serves as the centerpiece for the spaces devoted to scholarly research, while the second focuses on public activity and conferences. 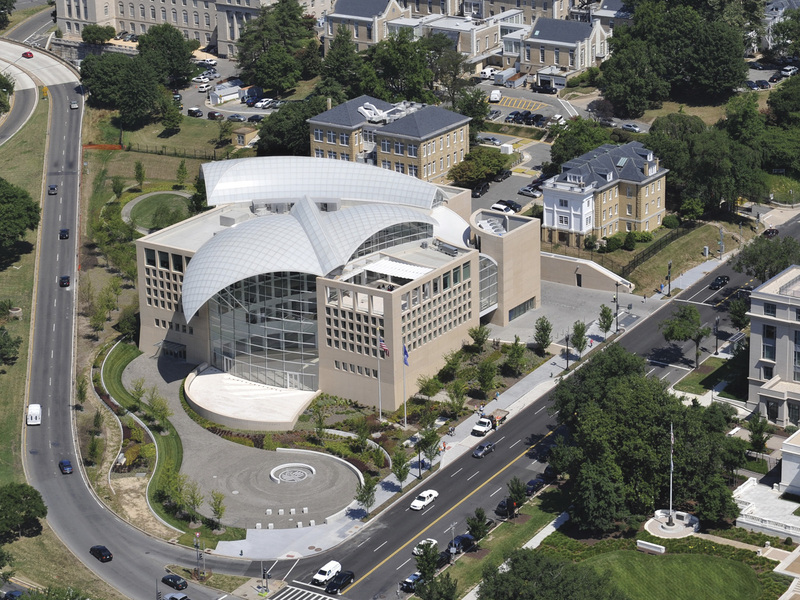 By its very nature, set on the National Mall, across from the Vietnam and Lincoln Memorials, the institute is a national symbol of peace. 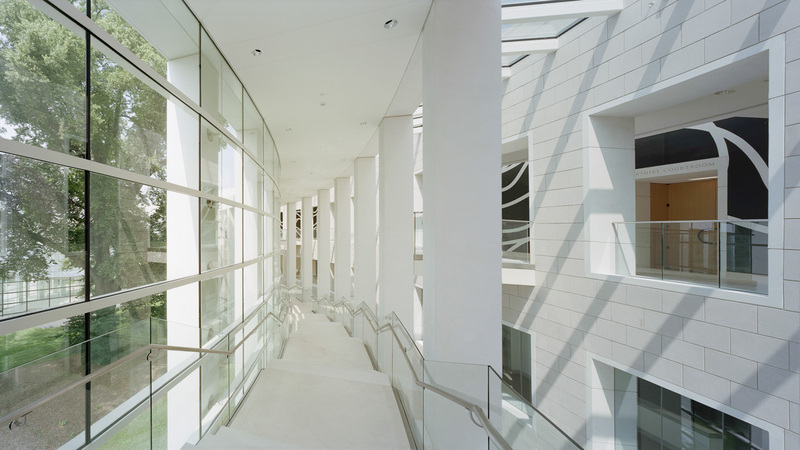 Seen from one of the major entry points into the District, the architecture evokes an air of serenity and lightness of being, while providing a most effective research and operating center. 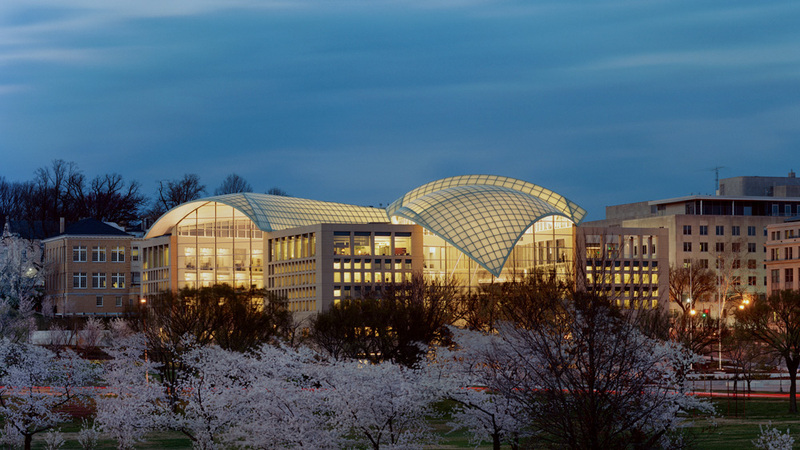 Its exuberant roof form’s character changes character with the light: it is opaque white during the day, evoking neighboring domes and traditional symbols of peace, and seems to glow from within at night, acting as a beacon on the skyline. 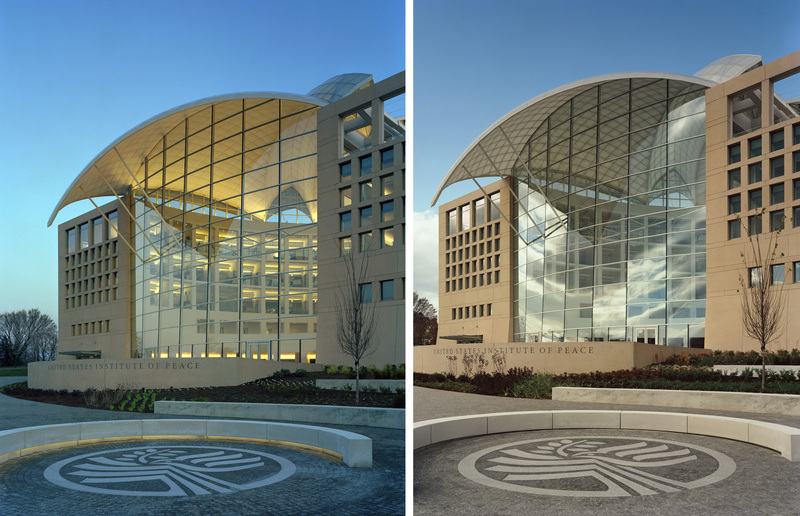 The United States Federal Courthouse in Springfield, Massachusetts, negotiates between the contrasting need for security in the various zones and the desire for a publicly accessible building, in addition to responding to the surrounding context and protecting valuable assets on the site. 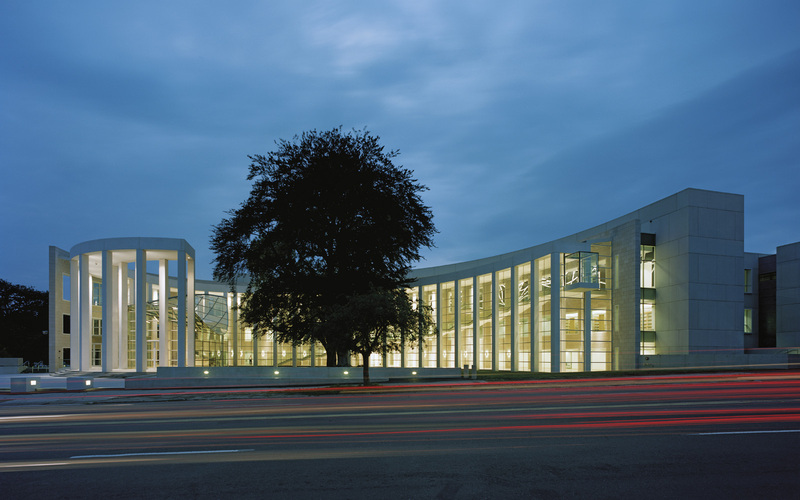 To do this, the functions of the courthouse, including offices for non-court agencies (US Attorneys, US Marshals, and US Congress members), four major courtrooms, and chambers for District judges, were conceived of as layers of space that wrap around a central courtyard. A curved colonnade enfolds historic trees in the courtyard, housing the main circulation path and bringing light and openness into the the spaces. 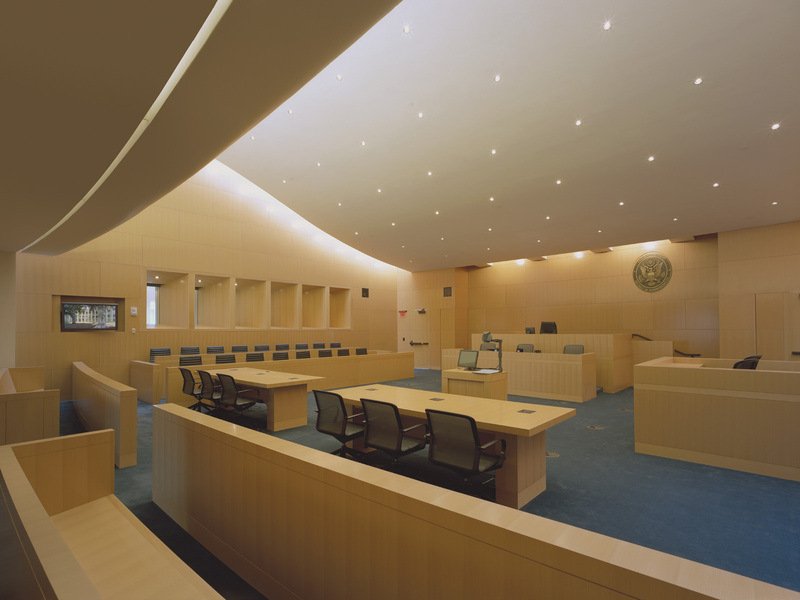 A band of courtrooms accessed by a series of bridges forms the next layer, and is followed by the most secure section which houses the judges chambers. The layers are highly visible to each other, with light permeating from the courtyard and from skylights, subtly denoting the shift from most public to most secure. While the zones are physically separated and access is carefully choreographed by the circulation spine, the visual connections across the layers are an expression of the transparency of the judicial process and its importance and dignity in our civic society.